The Selene 42 EU is a logic further development based on the successful Selene 42 concept. She adds a complete new superstructure on the proven 42 hull design with i.e. her full length keel with a full protected propeller, her large rudder and cruiser stern which improves the sailing capabilities in the ever challenging following seas. The Selene 45 is one of the Next Generation Selene Trawlers. She is the smallest model of the popular and proven Selene Pilothouse Trawler line. Designed and built like her sisters – including the oceangoing CE “A” certificate –she is a serious passagemaker, and a superlative coastwise and inland cruiser. The Selene 49 is the “next generation” evolution of the very popular Selene 48 model. It features the new “deep hull” design with its cruiser stern, 30cm increase in engine room headroom, and the larger, standard Cummins QSL 9.0 330 hp. engine. LOA is over 30cm longer. On the interior, that also translates to a 20cm increase in the cockpit and 10cm more in the salon. The Selene 54 is a very comfortable trawler yacht, which has been developed based on many attributes that made her predecessor, the Selene 53, so popular. For example the large salon/cockpit and boat deck that are very spacious. The Selene 54 keeps this attributes and the robust hull makes this yacht even more stable and efficient for offshore passages. The Selene 60 is a completely new design from an entirely new mold. The Selene 60 features a full-height engine room, a separate crew’s quarters aft, European transom, and a full-width utility room for work, storage, electrical systems, freezer, and washer/dryer. An expansive and functional flybridge layout has been incorporated to include a 10 person U-shaped sofa with a bureau for BBQ, sink and a smaller refrigerator. The Selene 62 brings quality, comfort and exploration together, built under the craftsmanship of Jet-Tern Marine in China. The interior was designed by the internationally renowned designer Ken Freivokh, using quality teak / cherry and fine granites, complimented by beautiful fabrics. The luxurious layout consists of three bedrooms, which all have unsuited bathrooms. The Selene 66 leads the fleet classic Selene Ocean Trawlers designed by Howard Chen. The Selene 66 is built on the same hull mold as the Selene 62 and the increase in length allows for significant expansion of living and operating spaces throughout the boat. The spacious cockpit of the Selene 66 has enough room for lounge chairs in addition to the built-in settee. This brand new Selene 60 Ocean Explorer is the smallest vessel of the Selene Explorer line. A first look, the Selene 60 Ocean Explorer by Guido de Groot shows a number of the Selene family traits with her powerful raised pilothouse, Portuguese bridge, and bulbous bow. But a contemporary twist is also apparent in the addition of the large side windows in the hull. This beautiful 72 foot (23 meter) yacht is the flagship of the Selene Ocean Trawler line. Classic in style like all the Selene ocean passage makers, but with a contemporary and elegant interior designed by Intan Nioridwan of the Atolla Design Studio in Singapore. Ordered by a client from North America, construction is under way on a new Selene 78 Ocean Explorer designed by Guido de Groot. With its impressive range and stylish interior, the yacht is ideal for longdistance (ocean) trips in complete luxury and comfort. The lines of the trawler are based on the larger Selene 92 Ocean Explorer, currently under construction at Jet-Tern Marine in China. The Selene 92 employs a traditional displacement yacht hull but with contemporary exterior styling and modern construction techniques. This combination is intended to exploit the advantages of an explorer or expedition yacht in being able to take on the roughest seas with immense range capabilities but also allows the stylish package of a modern luxury super yacht. 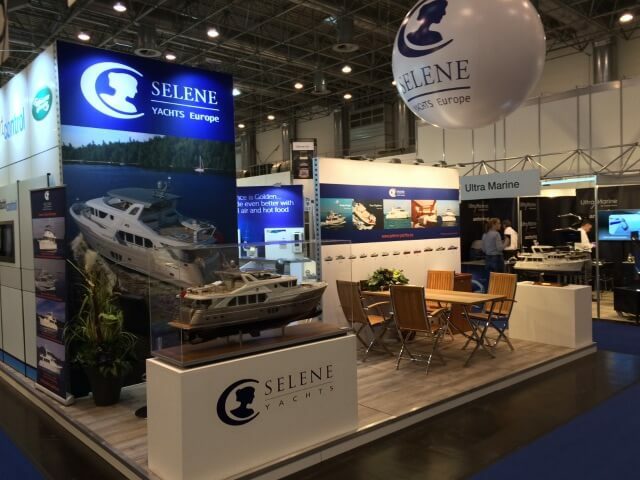 Meet Selene Yachts Europe from 23-31 January 2016 at Boot Düsseldorf in Germany: Hall 7a, stand B13. Selene Yachts Europa will attend the world’s largest water sport trade fair. On the stand you will find all the information of new and used Selene Yachts. Selene Yachts Europa would be delighted to welcome you at boat Düsseldorf to give a impression of the World of Selene Yachts. Selene will be happy to welcome you during the Cannes boat show.